I am swooning over this gorgeous bathroom designed by Kerrie Kelly! 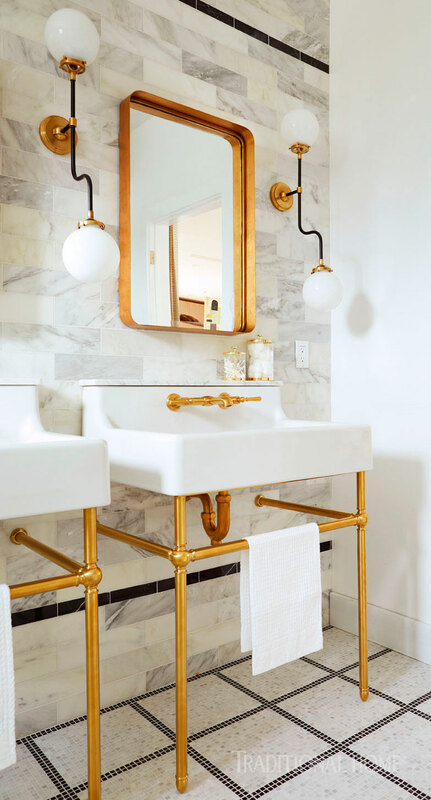 By combining marble tiles, classic vanities and satin-brass accents, this space feels timelessly luxurious, don't you think? I like how the marble tiles are carried all the way to the ceiling to draw your eye up, highlighting its beautiful tall ceiling. The vanities feel light and airy, without taking too much visual space, another wonderful addition to the tiny space. Meanwhile, the satin-brass accents exude warmth and elegance to the space. The sculptural sconces add style and panache to the room while the floor tiles offer a subtle yet delightful counterpoint to the bold lighting. I am absolutely in love with this stunning and stylish bathroom, how about you, my lovelies? Are you a fan of this fabulous space as well? Thoughts?
. I see why you are in love with this room. It is gorgeous!!!! I'm having a hard time with stand-alone sinks. I see so much wasted space below and to the sides. If I had my druthers, I'd have a vanity top spanning the space with storage underneath, with a large mirror overhead, and prettier lighting. But that's just me!